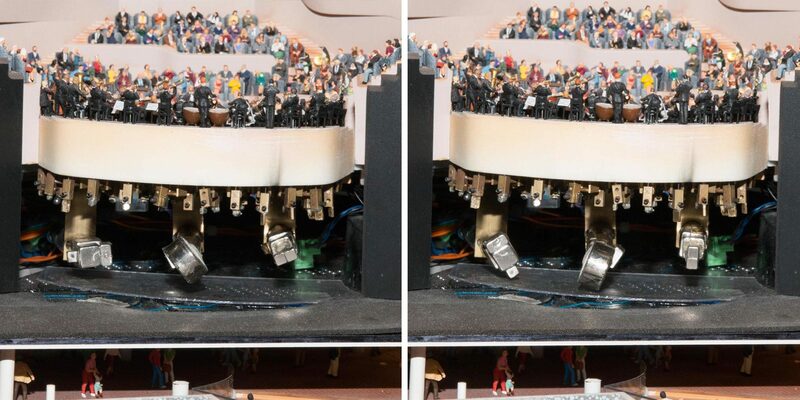 In Miniatur Wunderland, it was already inaugurated in 2013: The Elbphilharmonie in Hamburg's HafenCity! The Elbphilharmonie, whose original is currently under construction in Hamburg, is an absolute highlight among the models in Miniatur Wunderland. Not only because it is the most elaborate and with more than 200,000 Euro building costs the most expensive model in the exhibition and forms the centerpiece of the HafenCity in Miniatur Wunderland but also because of its fascinating technology. We not only faced the challenge of showing the architectural design, but also how to present the fascinating structures inside of the building. To cut the building open on one side would have impaired the aesthetic overall look, so we decided to “give it some wings”. It was clear upon building that the Elbphilharmonie would be equipped with a very special push-button action. Now, on the push of a button, the sidewalls unfold like wings and allow a view inside even the inner concert hall. If you push a button, the Wunderlander Elbphilharmonie is opening up revealing the impressive concert hall with musicians in motion. If you look closely you can see how the conductor’s arms and all the musicians are moving during performance. Looking even closer reveals: The musicians don’t move synchronized but seemingly independent of one another. This gives the impression of a lively orchestra presenting Prokofjew’s part music through body language as well. One might conclude that this requires a multitude of control units, engines, gearing mechanism and hinges to make the movements seem this real. In truth it is much simpler, yet more fascinating as well: magnetic fields. There are no hinges, gears or drive belts beneath the orchestra. Instead the musicians are sitting on top of a tiny metallic pole with a magnet at its bottom. This pole is restricted in its movements around its own axis through stoppers. The movement is triggered by three larger magnets below the little magnets of the orchestra, which rotate in different tempo and direction, keeping a consistent distance to the smaller magnets. The non homogenous movements of these magnets create an interchanging magnetic field which influences each musician differently due to their differing distances from the moving magnets below. The relative influence each magnet has on the musicians is therefore different, causing each of the musicians to move individually. With this solution we could mostly keep one of mechanics biggest enemies, friction, out of the picture. We don’t need gearing mechanism, hinges, belts or anything like that, which are quickly worn out by continuous use at the Wunderland and are high maintenance when it comes to service. Magnetism makes it possible to transport movement via air and therefore avoiding wear in a lot of places in the process. The only person individually animated in the orchestra is the boss. Both arms of the conductor are movable and not interlinked. He also has a small magnet in each arm and below him there are two individually controlled electro magnets which influence the respective arm and move it up and down. It is all down to fine-tuning now and positioning and moving the magnets around and of course to the stoppers of the magnets of the single musicians to make the impression of a playing orchestra perfect on the push of a button. One Button to fell them all!